According to all of the census' Charlotte Ashworth was born in Newchurch-in-Rossendale in 1828 but I cannot find any information about her birth or baptism. There has also been some confusion because there was also a Charlotte Fishwick who married a Robert Hamer in Newchurch in 1860 as well as a Sarah Ashworth who married a Henry Hamer at Hyndburn Registry Office in 1858. The former created confusion in the census records whilst the latter created confusion in the birth records. There were several children born during this period to Sarah Ashworth and Henry Hamer; I am assuming that all those recorded as being born in Rossendale are their children, these include: Gilbert Welsh Hamer (first Gilbert Welsh born in 1858 and died in 1858, second one born 1859), James Ashworth Hamer, 1861, and Elizabeth Ellen, 1863. In the 1841 census there is a Charlotte Ashworth, aged 10, who is a cotton piecer and is living with Fanny Ashworth, 5, George 40 and Ann 30, both of whom are cotton weavers. They are living in Stacksteads and were all born in Lancashire. So I am assuming this is our Charlotte and her family. Charlotte marries Edmund Hamer on 18th February 1849. The marriage certificate tells us that Charlotte's father is George who is a stone mason. It is also worth noting that Charlotte was able to sign her name whereas Edmund signed with an 'x'. Edmund is seven years older than Charlotte. 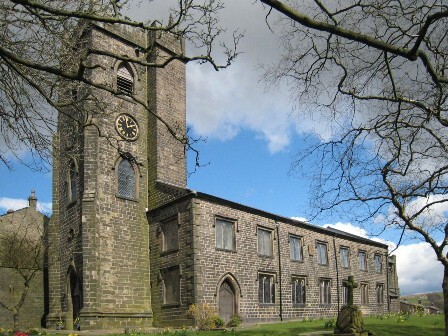 According to the Parish records, Charlotte and Edmund's first child, James Edward, was born at Scout on 7th November 1849 and was baptised on 23rd December at St Michael's, Lumb. Edmund was a cotton rover. James Edward died in December and was buried on 2nd January 1850 at St Nicholas', Newchurch. Their second child, Robert, was born on 6th November 1850 and christened on 9th March 1851 at St Nicholas' in Newchurch. He was born in Scout and his father, Edmund, was a cotton rover. The 1851 census was taken on 30th March. According to this, Edmund is 32 and a cotton spinner; Charlotte is 23 and they live in Scout. Their son Robert is four months old. Fanny Ashworth, aged 16 years who was a cotton piercer, was visiting; perhaps she was Charlotte's sister? It says that Fanny was born in Newton, Cheshire. Rachel Ann was born on 19th February 1853, and baptised on 22nd May 1853 at St Nicholas'. The family are still living in Scout but Edmund's occupation is now down as carder. According to Hall Geneology Website, Old occupations: Cotton grows in balls, or boles and is unusable in that state. The fibres must first be untangled and straightened out. Carding involved getting all the fibres running in the same direction. This was a skilled process involving the use of a brush with spikes, and was originally done by hand, later using a carding machine. A carder was normally an experienced worker, as if done badly it was not possible to rectify later and the raw cotton would be wasted. Fanny was born on 13th April 1855 and baptised on 24th June 1855, again at St Nicholas'; Edmund is back to being a cotton rover and the family are living at Greenside. John Edwin, my great grandfather, is born on 16th July 1857; I need to acquire his birth certificate. Robert, their second son, died at the age of 6, at Scout and was buried at St Nicholas' Newchurch on 11th October 1857. In 1859 George Henry and James - perhaps twins - are born; James Hamer died the same year. I need to confirm this with their birth certificate. By the 1861 census there is Edmund, 44, who is now a cotton rover; his wife Charlotte, 33, and their children Rachel Ann, 8, Fanny 6, John Edwin 4 and George Henry 1. All the children are down as being born in the Newchurch area apart from Fanny who is down as being born in Spotland (Rochdale); in a later census Fanny is down as being born in Bacup. In 1861, Bacup was part of the township of Spotland. There are also lodgers, Henry Robertshaw, 39 who was a cotton weaver who was unmarried and was born in Heptonstall, Yorkshire; John Pickup, 43 who was also unmarried and was a woollen weaver born at Clough Fold, Lancashire; as well as James Taylor, 27 a sawyer, his wife, Mary Ann, 29 and their daughter Betsey Ann, 1; James and Betsey Ann were born in Newchurch whilst Mary Ann was born in Whitworth. There is another James Hamer whose mother's surname was Ashworth born in Edenfield, 1861. This could be another child but, again, I would need his birth certificate to clarify this. Their last son, James Robert Hamer, is born in 1862. Charlotte's first husband, Edmund Hamer, died of pneumonia on 28th August 1863. He was 45 years old and had become a grocer. They were living at Roebuck, Scout Bottom. In 1865, Charlotte marries a William Whitaker but by the 1871 census, William has died. The family are living at the grocer's shop, in Scout/Roebuck. To one side is a wheelwright shop but this is empty to the other is a cottage and then two more shops, both unoccupied, followed by a Wollen Dye Works which is closed. After the Dye Works there is Shawclough Woollen Mill. This gives the impression that times are still hard. I was up this way in May 2012 and all the old houses and factories have been pulled down and there are lots of new build houses there now. Here is a link to Cotton Mills in Newchurch 1891 which shows the significant number of mills there used to be in this area. Charlotte Whitaker is down as head of the family, aged 42 and a widow, she is a grocer. It says she was born at Shawclough. Rachel Ann is 18 and Fanny 16, they are both cotton weavers; Rachel Ann was born in Roebuck, Fanny in Bacup. John Edwin is 13 and George Henry 11; both are warehouse boys, John Edwin works in the cotton industry whereas George Henry is in the woollen industry. John Robert is 9 and is a doffer, working in a spinning mill, replacing the full yarn bobbins with empties on the looms. George Henry and John Robert were both born in Roebuck whereas John Edwin is down as being born in Piercy. By the 1881 census the family are living at 4 Water Barn, Stacksteads, which is just after Tunstead Mill. Charlotte is now 53 and is still a grocer; James Robert is 19 and a grocer's assistant; she also has two grand-sons living with her, Herbert N aged 5 and Edmund N aged 4 months. The census says they were all born in Stacksteads. In 1882, Charlotte marries for a third time, to Elisha Pickup but he dies on 21st November 1889. Elisha had been married to Rebecca Moore for many years and seemed to have only one child, James Goodwin. Elisha had been a woollen weaver. At 63 years of age, Charlotte is living at 18 Nuttall's Buildings, Newchurch. She is a retired grocer. Then, at the age of 72 years, she dies on 12th February 1900; she is living at 145 Burnley Road, Newchurch. In her will she leaves £153 16s 9d to her eldest son, John Edwin, who is also a grocer. Charlotte is buried at St Nicholas' church but, according to Wilf Day of Rossendale Family History Society, the grave is in the Old Graveyard which is quite large and in three sections. The lower section is overgrown and not safe to venture into. The middle section is reasonably well maintained but a lot of the headstones have been laid down for safety reasons and some of them are face down. The upper section has been grassed over for mowing and has had a large number of the headstones moved to the sides of the church where some have been laid flat to make a pathway around the church and some have been used to make the steps at the entrance to the church. It is unlikely the headstone could be found. Rachel Ann married Joseph Henry Farrar in April 1874. Joseph was a grocer/shop keeper. They had two children, Edith and Edwin Henry. The family first lived at 35 Bridge St., Newchurch; they then moved to 143 Burnley Road, Rawtenstall formerly Newchurch; and finally to 13 Prospect St., Rawtenstall where Rachel died on 23rd October 1929 aged 67 years. She is buried at St Nicholas' grave yard, New Ground C 472. Her son, Edwin Henry, died at the age of 9 and is also buried at St Nicholas'. Edith marries Earnest Wilson in 1900. In the 1911 census they are living at 143 Burnley Road, Waterfoot and have a daughter, Dorothy aged 5. Earnest is still a grocer. All were born in Waterfoot. Fanny marries Jonas Nuttall in 1875. Fanny dies on 2nd December 1880 aged 25, she does not leave any children. George Henry marries Annie Sandiford in 1879. Annie came from Accrington. In 1881 George Henry is a railway goods porter, they live at Wales in Newchurch and have a one-year-old daughter, Alice. Ten years later they have moved to 462 Newchurch Rd., Stacksteads. George Henry is now a grocer and they also have a son, Edwin Kenyon who was born in Newchurch. By 1911 they have moved to Woodland Mount, Booth Road, Stacksteads. Their daughter Alice is still living with them, she is 31 years of age. George Henry dies on 6th April 1922, he leaves £7725.17s 8d to his widow, Annie, his daughter Alice and son, Edwin Kenyon, who is a billiard hall proprietor. James Robert marries Ellen Isherwood in 1884, they have a daughter, Lottie, in 1891 when they are living at 28 Burnley Road, Crawshawbooth. Ten years later they have moved to 548 Burnley Rd, Rawtenstall; they are still at this address in 1911. Lottie, their daughter is now 20 and a music teacher. The census tells us that they had another child who died. They have a boarder, Ellen's mother, Elizabeth Isherwood who was 68 years old, had been married 49 years, had eight children, one of whom had died. Elizabeth was born at Turnpike, Newchurch.